Working in New York and Los Angeles as a performer and arranger of popular music and a composer of concert music and grand opera with over 150 works to his name, the Black American musician William Grant Still combined European, New World and African musical heritages to create a unique modernist style which fused and transcended the contemporary influences of classical and jazz. "Troubled Island" (1949) tells the story of Jean-Jacques Dessalines, once a slave, then a rebel general and first Emperor of Haiti in the age of Napoleon. With dynamic scenes of heroism, love, betrayal and murder, as a commentary on the revolutionary life it parallels the better known tragedies of Spartacus and Emiliano Zapata. 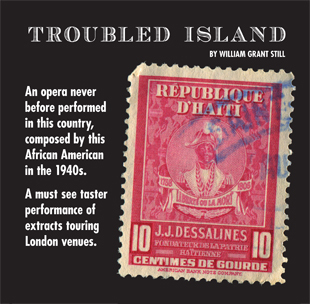 Troubled Island was composed by the black American, William Grant Still, little known in this country. Still, who was born in 1895 and died as recently as 1978, was a highly successful musician, whose repertoire and style spanned the worlds of popular, jazz, film and concert music. Even with over 150 classical compositions to his name, it was Still's ambition to write a grand opera. "Troubled Island", begun in 1936, was completed three years later. Here, in a sense, his troubles began, for two planned premieres, in 1945 and 1948, came to nothing. Then, in 1949, the piece was mounted at the New York City Opera, with white performers blacked up to play the principal roles of black Haitians. That night the opera received 22 curtain calls, and there were two more performances soon after, but it has been long believed that a group of hostile critics then got together to wreck it. "The critics have had a meeting to decide what to do about your opera", a friend told Still. "They think the coloured boy has gone far enough, and they have voted to pan your opera." We believe that the workshop performance, mounted with the generous support of The Arts Council of Great Britain and William Grant Still Music, is the first time that substantial parts of "Troubled Island" have been given in this country. The Opera's principal character is the historical figure, Jean-Jacques Dessalines. In the year 1758, Dessalines was born a slave in the French Caribbean sugar colony of St Domingue. At that time, St Domingue, worked by an army of half a million slaves in notoriously cruel conditions, was the most valuable colonial asset in the world. When, in the aftermath of the French Revolution, the slaves rose against their masters in 1791, Dessalines became a general under the leadership of the visionary black statesman Toussaint I'Ouverture. Following Toussaint's betrayal and death in French captivity, Dessalines took over the resistance, and in 1804 was proclaimed supreme governor of the independent black republic of Haiti, the first of its kind in the world, under the title Emperor Jacques the First. Two years later he was assassinated by his own officers. A terrifying and ruthless personality in real life, in the Opera's libretto by Langston Hughes and Verna Arvey, the composer's wife, Dessalines is shown very much as a tragic hero. As will be seen, on winning the supreme leadership, Dessalines' bravery and idealism are fatally undermined by the conflicting demands of office, an inability to read and write and so manage the government for himself, and the treachery of those closest to him. The supporting characters; Martel, the wise old slave counsellor, the conniving state secretary Vuval, the assassin Stenio, Celeste the slave mother and Dessalines' unfaithful mulatto mistress, Claire, are fictitious. But in the Cassandra-like figure of Azelia, the hero's rejected slave wife, there is an echo of historical truth. For, as Dessalines' mutilated corpse was thrown out into the street, with the soldiers shouting "The tyrant is killed", all around, an old black woman, known as Defilee, wept over it as it lay in the dust.